Should You Be Monitoring Your Child's Cell Phone Usage? Flexispy Reviews for iPhone and Android: Does It Really Work? Should You Be Monitoring Your Child’s Cell Phone? I want my children to be safe. I insist on seatbelt and helmets, and I try to avoid processed foods. However, there are some dangers that I feel helpless against. Most of those dangers are associated with the internet and cellphones that our children have access to today. Our children want privacy, but we want to ensure that we protect them. So that gives parents the new debate about whether we should monitor our children's cellphone and internet activity with cell phone monitoring software or not. Smart phone allow users to access the entire internet at their fingertips. Unfortunately, this means that they have access to the dangerous aspects of the internet as well. Children can come across pornographic website way earlier than their developing mind can comprehend, they can meet predators online, and they can become the victim of cyberbullying and other malicious practices. Teenagers may think that they are smart enough to spot all of the dangers, but they are in a tumultuous point in their life. Their hormones and the input of friends can cause your teenager to make a bad decision. If they're really looking for trouble, they might even try to run off with a stronger from the internet. That was one of the scariest stories I heard about my daughter's friend. Luckily, the girl was found shortly because of the GPS on her phone. Because of these dangers, it's becoming more and more popular for people to see what their children are doing on their computers and cell phones. 60% of parents check their teenager's browser history, 61% check social media, and 48% check text messages. If your children say that their friends' parents don't check their cell phones and computers, tell them that they are most likely wrong. So how do you monitor your children? One option is something known as spyware. Spyware is software that you can put on a phone that allows you to monitor the activity on that particular phone from your phone or a computer. For a look at our favorite software check out this article discussing the b﻿﻿﻿est phone spying apps on the market. You can look at things like text messages, website history, GPS location, and more. You can even read through text messages if you are worried about your child talking to someone that they shouldn't. With apps like TeenSafe You can also see website history to ensure they're not going to websites that they shouldn't. You can look at this information in real time, so if your child is late for curfew, you can check the GPS to see exactly where they are. It'll also let you know when your child is posting online. You can tell if they are paying attention during class or using their phone. In many cases, you can set up alarms to tell you things like if your child is on their phone late at night or if their GPS location goes out of range at odd times. As children get older, they need some levels of privacy. Of course, it's difficult to determine exactly how much privacy to give them. You don't to impede their growth, but you also want to keep them safe. Remember when you were younger and you wanted privacy? I know that I sure did. Sometimes it was for legitimate reasons. Other times, it was because I was doing something wrong. 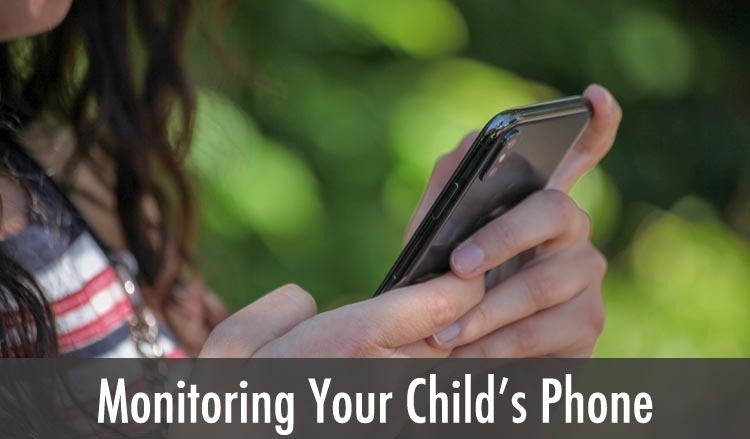 It's also important to determine when you are helping your child and when you are simply being nosy and intrusive with cell phone monitoring software just like anything else. Do you really need to read your daughter's diary or are you just curious? Ask yourself the same thing before going through text messages. If you do decide to monitor your child's phone, be sure to keep them informed. It's not fair to monitor them without their knowledge. You'll also need to explain in detail exactly why you want to monitor them. If they are extremely upset with it, you should clarify when you would stop monitoring their phone. You can also have software on their phone in the case of emergencies without actually going through everything every day. As a parent myself, I understand the difficulties that we face today when it comes to technology. We have to find a balance between being responsible parents and being invasive when it comes to our children's technology. Age can play a huge factor, but it's extremely important to monitor a child if they are lucky enough to have a cellphone or laptop. Remember that you don't always have to be the cool parent. It's also important to remember that you are the one who pays for the cell phone, so you are allowed to do whatever you want with it. If you'd like more information about our favorite products check out this article on mSpy. Of all the products on the market we've found it to offer the best balance of price, performance, and features. They also have extremely responsive tech support for any issues that might come up.